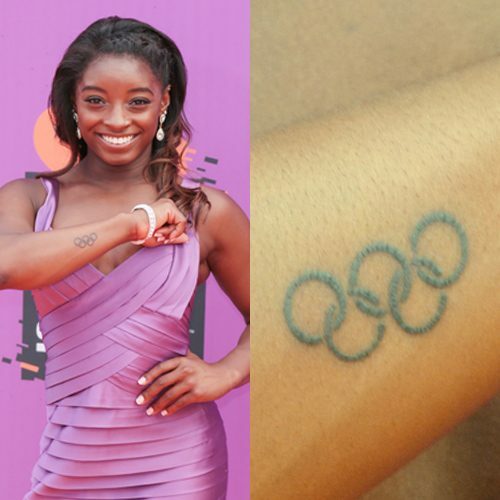 Simone Biles has a tattoo with the Olympic rings on her right forearm. 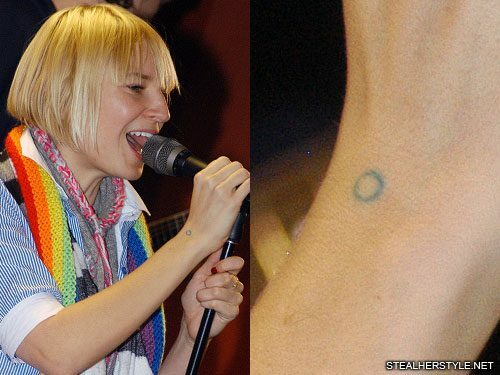 Sia has a small blue circle inked on the back of her right wrist which predates many of her other tattoos. 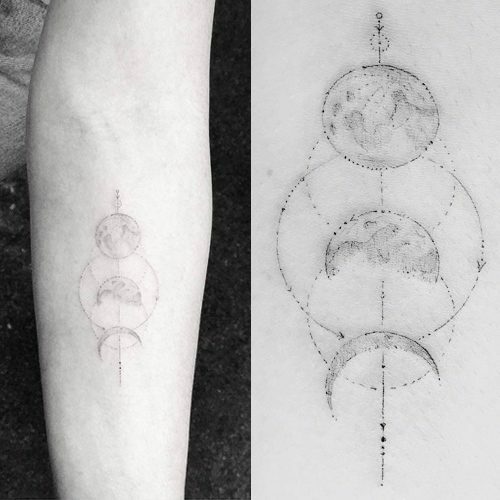 She hasn’t talked about its personal meaning, but circles are often a symbol for eternity. Sophie Turner paid tribute to her role as Jean Grey in the X-Men movie series by getting a tattoo of the X-Men logo on her left side. 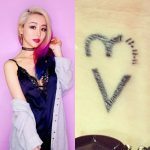 It’s not known exactly when she got the ribcage tattoo, which was first seen at the Beijing premiere of X-Men: Apocalypse in May 2016. 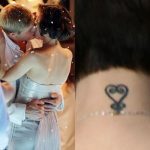 Rather than getting the classic X-Men logo, which has much thicker lines, her tattoo shows as updated version which serves as the logo for Xavier’s School for Gifted Youngsters in the film. Sophie played a younger version of Jean Grey who was a student at the school. She will resume her role as a more mature Jean Grey and alter-ego the Phoenix in the 2019 film X-Men: Dark Phoenix. 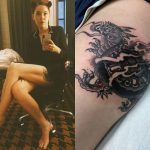 Fellow actress Alexandra Shipp, who plays Ororo Munroe / Storm, has a matching tattoo. 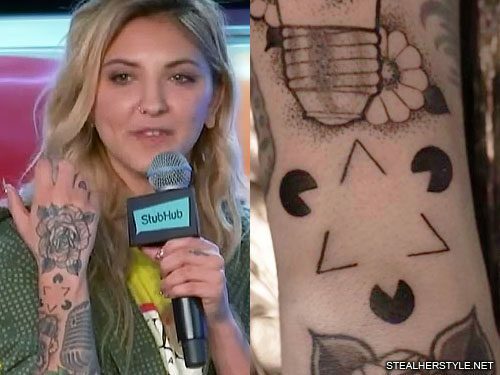 Julia Michaels has an interesting tattoo design on her right wrist consisting of three V-shapes and three circles. You can see two triangles in the negative space even though they are not fully formed. This optical illusion is why the design resonated with Julia. 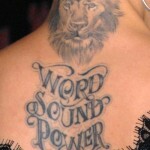 It represents the power of the human mind to see beyond what exists on the surface. 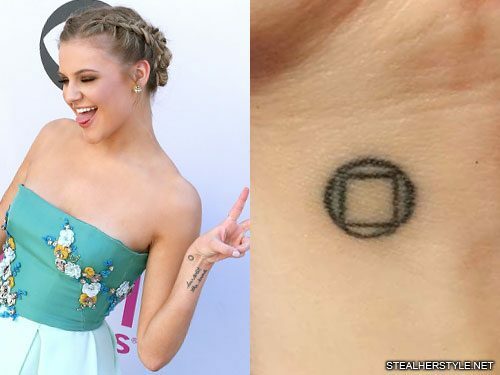 People like to make fun of me for it because they’re like ‘oh Pac Man!’ But this is actually a symbol for perception. It has two triangles and three circles, but nothing is actually fully formed. Even though the brain perceives it as whole, and it’s not, which I think is really interesting how you can perceive something as whole even when it’s not. This design, called the Kanizsa triangle, is a famous optical illusion created by the Italian psychologist Gaetano Kanizsa in 1955. Jackie Cruz has an outlined circle ink on her left rib cage. 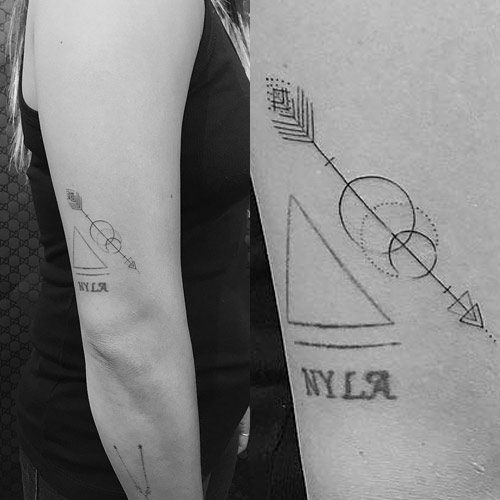 Jenna Ushkowitz added a triangle and one arrow with circles design above her elbow tattoo that says “NYLA”.